Unlock your Vtelca with the number one unlocking company. Permanent unlocking service and valid for all Vtelca models. Method recommended by Vtelca and the network carriers. 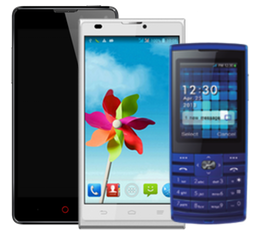 Unlock your cell phone for the lowest price. How to unlock my Vtelca phone with doctorSIM? Once you've made your request through doctorSIM, within a guaranteed time frame, we'll send simple step-by-step instructions to your e-mail on how to insert the unlock code and complete the unlocking process. You will have your Vtelca phone permanently unlocked in no time! How long will it take you to unlock my Vtelca phone? The Guaranteed Delivery Time will be displayed once you have selected the carrier to which your phone is locked. We will also let you know the Average Delivery Time of the previous 20 similar unlocking requests. How much do you charge to unlock a Vtelca phone? The price for unlocking your Vtelca phone depends on a number of factors including the country and network carrier the phone is locked to. As well as accumulating discounts with every unlocking you make, we also offer regular promotions. Does my Vtelca phone have a limited number of unlocking attempts? You have an unlimited amount of attempts to unlock your Vtelca phone as this make doesn't have this particular restriction. Nevertheless, the unlock code we send you will work the first time. No. Unlocking your phone via IMEI with doctorSIM will keep the phone manufacturer's warranty. Do you issue refunds if you cannot unlock my phone? In the rare event your Vtelca phone cannot be unlocked for any reason under our responsibility, we will return your money. However, due to the unlock process being fully automated we cannot issue refunds if any of the information we receive from you is incorrect. Double check all details before submitting your request. A blacklist check is an anonymous review of a shared database listing all phones that have been reported due to loss, theft or unpaid bill. We recommend this check if you are unsure of the current status of your phone because if reported, you may have incoming/outgoing call restrictions. These restrictions normally only apply to the country of origin of the carrier that placed the phone on the blacklist. However, as the blacklist regulations change regularly, we cannot guarantee that these restrictions do not extend to other countries as well. Can doctorSIM remove my Vtelca phone from the blacklist? No, we can't. Our phone unlocking services are for releasing phones from their network carrier and cannot remove this additional security measure. Only the network that reported the phone can remove it from the blacklist. Once removed, you can unlock your Vtelca with doctorSIM for use on any GSM carrier in the world. Unlocking via IMEI guarantees your warranty remains intact. You can continue to use your Vtelca during the unlocking process. Our services work for all Vtelca models. Customer support available to answer any questions. Our permanent unlock codes are also valid for foreign networks. Thousands of satisfied customers all over the globe. The cell phone unlocking leader for over 10 years.